If you’ve been to a CYPT show in the last two years, chances are, you’ve seen a new face on our stage that’s making quite the impact – and he’s back this summer as the youngest cast member (by far) in our production of The Fan. He’s an incredibly versatile and talented performer, not just for his age but for any age! You’ve mostly seen him in comedic roles – as the tiny Chelmnik and Russian soldier in Village of Idiots, as the bombastic Cardinal Richelieu in Three Musketeers, and as the Count in The Fan – but what you might not know is that he’s also a very strong dramatic actor capable of extremely nuanced performance. We love having his talent, his quirky spirit, and his sense of humor on our stage, and we know our audiences look forward to watching him blossom. And who is this venerable virtuoso who we value for his vibrancy, versatility, and valour? 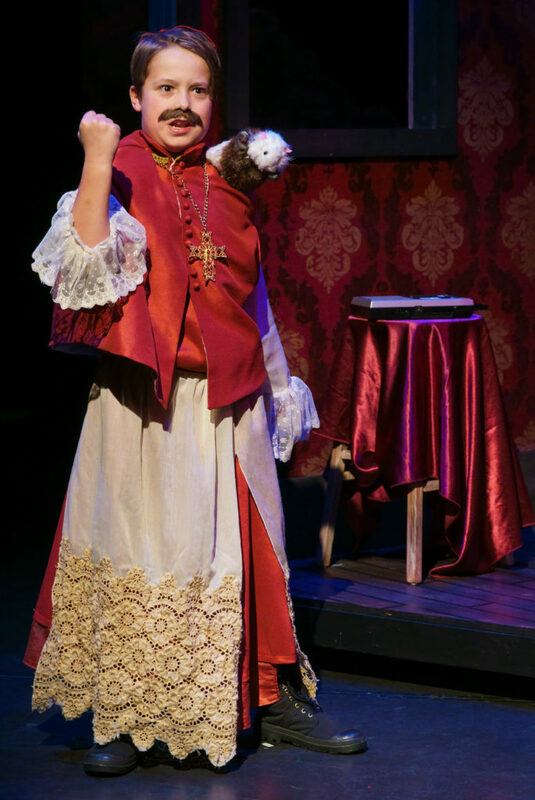 Anton as Cardinal Richelieu in The Three Musketeers (2016). Anton Matsigura is a student at Queen Elizabeth School who loves to socialize with others and be the person he truly is – a crazy witty odd kid who loves the stage and everything about it. This is Anton’s third year at CYPT and Anton has been in other theatre companies such as The Clock Theatre and was on stage since he was five and since acted in almost two dozen shows. He enjoys putting smiles on people’s faces and showing them that life should be cherished and yet not wasted. Anton as Brodsky in Village of Idiots (2016). Photo by Rob Galbraith/Little Guy Media. 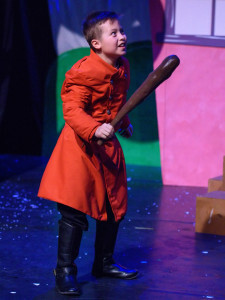 Past credits include: The Three Musketeers, The Village of Idiots, The Paperbag Princess and Other Munch Magic (CYPT); The Beatles, The Songs of Sondheim Musical (Calgary Arts Commons); The Wizard of OZ, The Princess and the Pea, Morozko, Aibolit and Barmalei, Nutcracker, Red Riding Hood, Alice in Wonderland, Puss in Boots, Tarkanische, Cinderella, Blue Puppy, Snow Queen, Mama (The Clock Theatre); The Hero Squares, The Monet and other Artists (Sunnyside School); Sunnyside and the Flood of 2013, Haiti Relief Show (Trickster Theatre / Sunnyside School). All faculties he did employ. Finally released from his cage. What are you doing Anton? You have gone too far. You must show humility to become a star and that it is what I shall do, said the boy, use my art to bring happiness and joy. 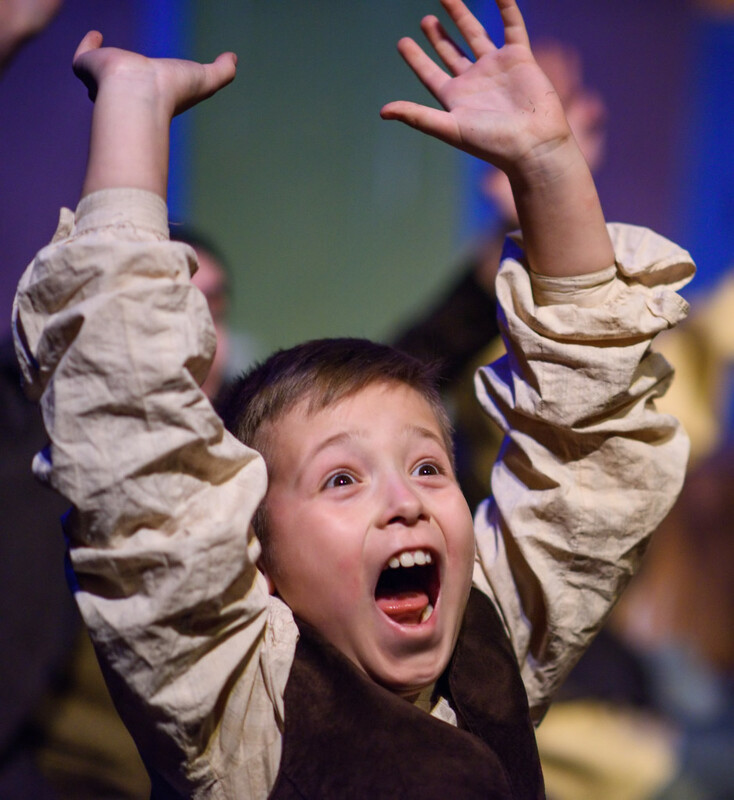 Anton’s 4th production at CYPT has him so excited and jumping with glee. Thankful for these opportunities Anton he expresses his gratuities. … #blessed. A fetus, a sprout, nothing more trained and knowledged by his first mentor (Gandalf the Grey) he trailed over land and sailed by sea and finally made it home to CYPT.